This fall’s taste test vegetable – the sweet potato - is already taking root and flourishing in gardens across the district. Planted in May, these tasty tubers take nearly three months to grow big and delicious underground. Sweet potatoes are an easy summer crop that requires very little upkeep, especially with all of this summer’s rain. Ready for harvest in late September, we will let these delicious potatoes cure for a month above ground as their sugars and sweetness develop. October will bring sweet potato taste tests to all of the schools, as students will get to taste the fruits – and roots! – of their labors. 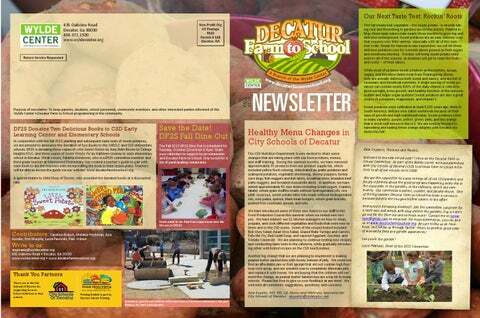 Purpose of newsletter: To keep parents, students, school personnel, community members, and other interested parties informed of the Wylde Center’s Decatur Farm to School programming in the community. DF2S Donates Two Delicious Books to CSD Early Learning Center and Elementary Schools In conjunction with the fall 2013 planting and subsequent taste tests of sweet potatoes, we are pleased to announce the donation of two books to the CHECLC and CSD elementary schools. DF2S is donating three copies of Little Sweet Potato by Amy Beth Bloom to College Heights ECLC, and three copies of Sweet Potato Pie by Kathleen Lindsey to each elementary school in Decatur. What’s more, Tabitha Wiedower, who is a DF2S committee member and third grade teacher at Glennwood Elementary, has created a teacher’s guide to pair with each book to aid the teachers with incorporating the book in their lesson plans. Teachers will be able to access the guide via our website: www.decaturfarmtoschool.org. Save the Date! DF2S Fall Dine Out The Fall 2013 DF2S Dine Out is scheduled for Tuesday, October 22nd from 5-9pm. Mark your calendars to support local restaurants and Decatur Farm to School. Stay tuned for a list of participating restaurants. A special thanks to Little Shop of Stories, who provided the donated books at a discounted rate. Funds raised by the Dine Outs support taste tests like this one at CHECLC. Printing funded in part by Decatur Atlanta Printing. Healthy Menu Changes in City Schools of Decatur The CSD Nutrition Department is very excited to share some changes that are taking place with our food products, menus, and staff training. During the summer months, we have removed approximately 70 products from our product supply list, which included yellow food coloring, dehydrated au gratin potatoes and scalloped potatoes, vegetable shortening, shrimp poppers, turkey corn dogs, fish nuggets and fish sticks, breakfast bites, breaded beef patty nuggets, and breaded mozzarella sticks. In addition, we have added approximately 50 new items including Greek yogurt, Craisins, falafel, whole grain muffins made without hydrogenated oils, rice pilaf, couscous, sweet potato tater tots made without hydrogenated oils, orzo pasta, quinoa, black bean burgers, whole grain biscuits, peanut-free (soybean) spread, and tofu. We have introduced some of these new items to our staff in the Food Production Course this summer when we tested new recipes. We have trained our 12 kitchen managers on how to clean, prepare, and cook different vegetables and foods that were new to them and to the CSD menu. Some of the recipes tested included Bok Choy Salad, Asian Orzo Salad, Glazed Baby Turnips and Carrots, Tofu Stir Fry, Red Lentil Soup, and Layered Eggplant, Zucchini, and Tomato Casserole. We are planning to continue testing new recipes and conducting taste tests in the cafeteria, while gradually introducing other well-tested recipes on the CSD lunch menus. Another big change that we are planning to implement is making peanut butter sandwiches with honey instead of jelly. We could not find an affordable jam or fruit spread that did not contain high fructose corn syrup, and our solution was to completely eliminate jelly and replace it with honey. We are hoping that the children will not mind the change, as peanut butter sandwiches are a big hit in many schools. Please feel free to give us your feedback at any time! We welcome all comments, suggestions, questions, and concerns. Thank You Partners Thank you to the City Schools of Decatur for supporting Farm to School initiatives in their schools. Ana Kucelin, MS, RD, LD, Menu and Wellness Specialist for City Schools of Decatur akucelin@csdecatur.net Volunteers, parents and students built raised beds at Clairemont Elementary this past February for their school garden. While most of us know sweet potatoes as the buttery, syrupy, sugary, marshmallow-laden treat from Thanksgiving dinner, they are actually delicious both sweet and savory, and are full of necessary and beneficial nutrients. A single serving of sweet potatoes can contain nearly 800% of the daily vitamin A critical to good eyesight, bone growth, and healthy function of the immune system and major organ systems! Sweet potatoes are also a great source of potassium, magnesium, and vitamin C. Sweet potatoes were cultivated at least 5,000 years ago, likely in South America, and are now eaten worldwide because of their ease of growth and high nutritional value. Sweet potatoes come in many varieties: purple, yellow, green, pink, and the orange that is most well known in the U.S. We are looking forward to harvesting and tasting these orange delights with Decatur students this fall! There are two new faces on the Decatur Farm to School scene, and we are pleased to announce their arrivals! Melanie Heckman started at the Wylde Center in February and Ana Kucelin joined City Schools of Decatur in February. Volunteer Spotlight: Anne-Marie Anderson Anne-Marie Anderson has been volunteering for the last two years with Clairemont Elementary School, where her daughter Scarlett is a rising third grader. Together in consultation with teachers, students, parents, landscaping staff, and DF2S, she helped develop a school garden plan. Last year, parents and students installed the first phase: 12 raised beds that have already been used to grow lettuce and collards for cafeteria tastings, and a composting station, so students can study soil formation and structure, and maybe raise worms as class pets. “As a parent and landscape professional (my business, The Celtic Gardener, helps clients with edible landscaping, chickens, and bees), I can’t think of anything more important than encouraging children to find out how plants grow, where their food comes from, and that it’s OK to get dirty! There’s nothing like planting a seed, watering it, and watching what happens. It’s all a big science experiment, and we learn just as much when something doesn’t grow as when it does. Decatur Farm to School is a real driving force to help local schools maximize their resources, and to provide hands-on assistance and expertise when time and people power are limited. 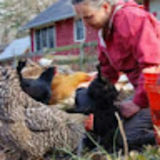 We have a tendency to overcomplicate things, so simple veggie plantings and cafeteria tastings are a fabulous reminder that we can all grow and appreciate healthy, local food.” Anne-Marie first visited the Wylde Center in 2009 to attend ‘Chickens 101’. Four years later, she now teaches that same class, volunteers as Chair of the Urban Coop Tour, is a member of the Bee Team and enjoys taking full advantage of the unrivalled schedule of classes and events. Collards a Tasty Success The sweet potato plantings come immediately on the heels of this spring’s collard plantings and taste tests. At the end of May, students from College Heights and Winnona Park harvested and tasted the young, raw collard greens they grew themselves. At College Heights, 98% of students bravely tried the new vegetable, and 78% liked it. Among the students at Winnona Park, 88% of the students tried the collards and 61% of the students liked them. Golden, from Ms. Edwards’ class, exclaimed, “I love this stuff!” while Maya, from Miss March’s class, liked it so much she asked, “Did a professional make this?” In Ms. Tolsman’s class, a full quarter of the class was clamoring for seconds of the tasty greens! With such success, we can’t wait to try the sweet potatoes this fall with even more students! Are YOU interested in the Summer 2014 DF2S internship? Look for applications this winter! Nate Scully during his internship at Sugar Creek Garden. Nichole Lupo, the Wylde Center’s Garden to Classroom Coordinator plants sweet potatoes with students at the College Heights Early Learning Center.